Thursday evening I attended the Opening Reception for the 4th Juried Members Exhibit at the Fiber Art Center in Amherst, MA. It was a lively gathering which matched the liveliness of the work, a varied display of fiber art from the vibrant to the subtle and representing many aspects and techniques of fiber art. 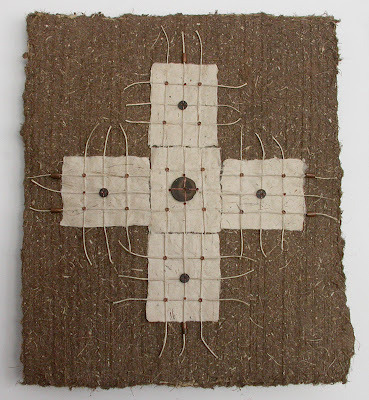 I have one piece in the show, Universal Guardians, which is a vertical triptych in paper quilt form using handmade paper from Bhutan, Africa, and India with hemp cord, coconut disc beads, copper beads, and thread. The cross is an ancient symbol that has long signified protection. I am always fascinated by the way art can be seen and interpreted in so many different ways. I was intrigued to hear the crosses reminded someone of the circuit boards in old computers. The exhibition runs through February 24. Gallery hours are Tuesday through Saturday 10 to 5:30.